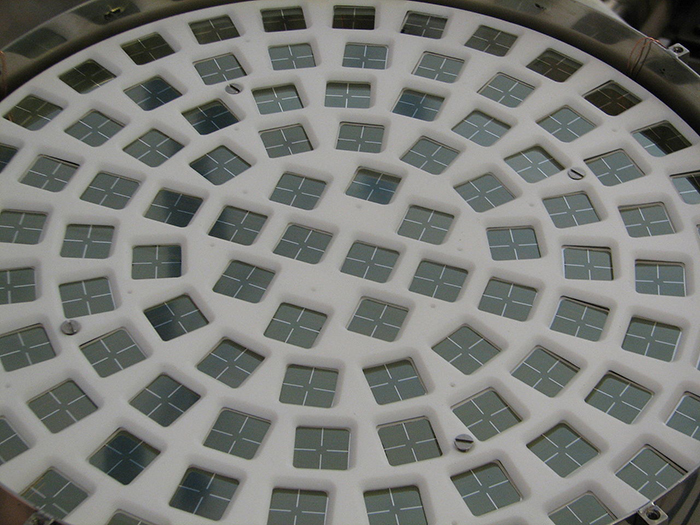 A new metamaterial in which the Hall-effect response of electrons to a magnetic field can be controlled and even inverted has been created by Christian Kern, Muamer Kadic and Martin Wegener at the Karlsruhe Institute of Technology, Germany. The Hall effect involves the deflection of electrons as they travel through a conductor in an applied magnetic field. The deflection creates a voltage across the width of the conductor. Very sensitive measurements of magnetic-field strength can be made by measuring this voltage, which can be expressed in terms of the Hall coefficient. This is normally an intrinsic property of a material that depends on whether the charge carriers are electrons (resulting in a negative Hall coefficient) or holes (positive coefficient). 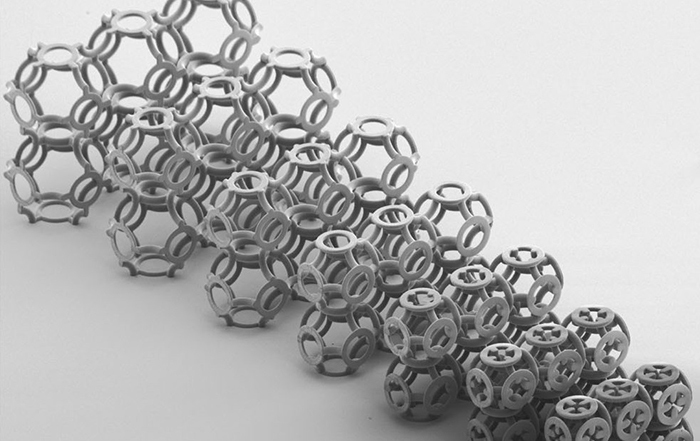 The new metamaterial has a chainmail-like structure of interlocking micron-sized rings of hollow semiconductor. By changing how densely packed the structure is, Kern and colleagues are able to fine-tune the Hall coefficient and even reverse its sign. The research is described in Physical Review Letters and could lead to the development of specialized magnetic-field detectors. For nearly 20 years, successive DAMA experiments deep underground at the Gran Sasso National Laboratory in Italy have reported a strong annual oscillation in the signal from their dark-matter detectors. The statistical significance of the oscillation is now a whopping 9.3σ – well beyond the 5σ that signifies a discovery. Some physicists believe that this is the first direct detection of dark matter. However, others disagree because apart from the CoGeNT detector in the US, which has seen a similar but smaller effect, no other dark-matter searches across the globe have detected an oscillation. Now, physicists working on the XENON100 dark-matter experiment at Gran Sasso say that they have also failed to see the annual oscillation after a run of four years. Writing in a preprint on arXiv, the team claims that its study suggests that the DAMA oscillation is not the result of dark-matter interactions at a statistical significance of 5.7σ. So now physicists are faced with the astonishing situation that one experiment (XENON100) has "discovered" that the discovery of another experiment has not occurred. NASA has chosen its next two missions as part of the space-agency's Discovery Progam. Psyche and Lucy were selected from five proposals and will each cost approximately $450m to develop. Psyche will help scientists understand how planets and other bodies separated into layers – including cores, mantles and crusts – by studying the asteroid 16 Psyche, which is around 200 km in diameter and consists of almost pure nickel–iron metal. 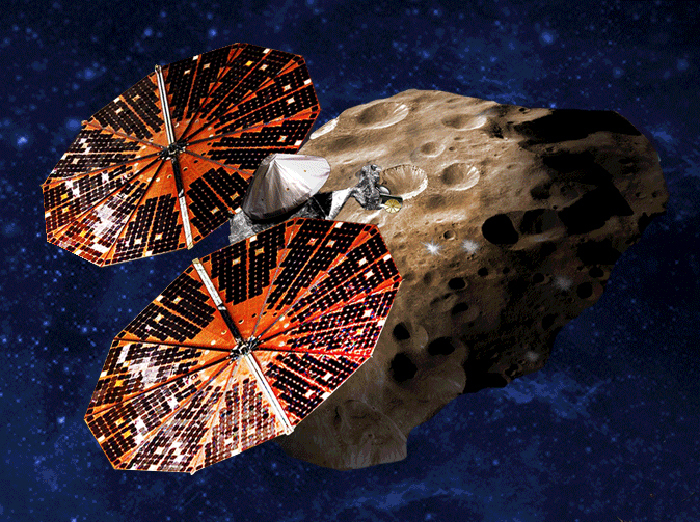 Psyche is targeted to launch in October 2023, arriving at the asteroid in 2030, following a Mars fly-by in 2025. Lucy, meanwhile, will visit Jupiter's Trojan asteroids and study the origins of giant planets by looking at the fragments left over from their formation. The probe is expected to launch in 2021 and arrive at its target by 2027. Created in 1992, NASA's Discovery Program funds missions to explore the solar system with focused scientific goals. In the past it has funded 12 probes, including the MESSENGER mission to Mercury, the Kepler exoplanet hunter, and the InSight craft that is scheduled to launch for Mars in 2018. The article has been written by Hamish Johnston - editor of physicsworld.com. Physics World is the membership magazine of the Institute of Physics, one of the largest physical societies in the world. Internationally recognized as a leading physics publication, it provides incisive, global coverage of all topics of interest to physicists.